Lynn Short is a Professor of Horticulture at Humber College, she is an incredibly dynamic and hands on community organizer & Phragmites eradicator in the Wymbolwood Beach area near Midland, where she has cottaged more than 40 years. 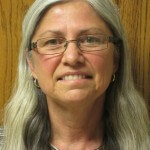 Lynn also served as the Senior Nature Interpreter at the Centre for Urban Ecology at Humber College for many years. Her teaching has included the development of programs for visiting school groups from Kindergarten to Grade 12 with a focus to connecting students with local ecosystems and developing a sense of stewardship through activities; and continues with her instruction in courses on Plant Health Care and Sustainable Horticulture Practices at the College. 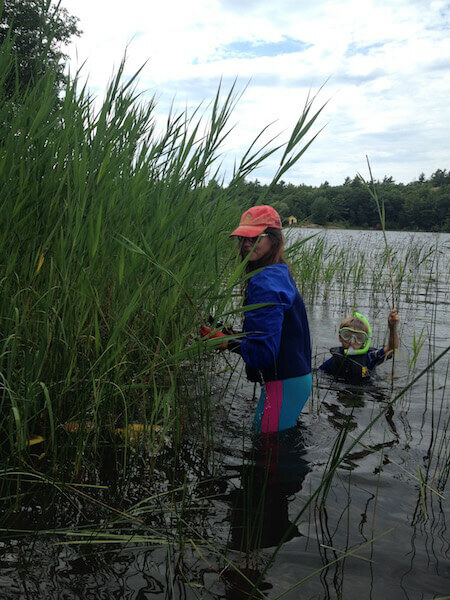 GBF is supporting some research she is conducting around cut timing; and she has helped Georgian Bay Forever in workshops with identifying Native Phragmites vs. Non-Native Phragmites and cutting in soft substrates. The study site is on the Humber Arboretum near Humberwood Downs Community Centre. There is a parking lot adjacent to the site so that it is easily accessible. There are two stands of Phragmites australis close to each other but relatively distinct. One is smaller than the other. I plan to use sample plots from both sites. The study would last from the beginning of May to the end of August (4 months). I plan to divide each stand into five sections. All sections would be cleared of dead material in May to make it easier to work there. It is hard to insert the spade through the dead stalks. The depth of the detritus would be measured prior to removal. The dead plant material that is removed will be taken to the composting site at Humber College down in the valley behind the residences. A composite soil sample will be collected after the dead stalks are removed to be sent for testing. NPK, %sand/silt/clay (texture) and Organic Matter will be measured. In each section, 1m x 1m plots would be staked out for study. Four plots would be staked out and randomly spaced within the two stands for each of the five test sections so that there will be four replicates of data for each section. 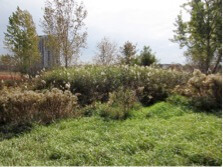 They will be located inside the test sections to avoid being too close to the influence of parent Phragmites plants outside of the plots since new rhizome growth may occur into the plots and with them new shoots immediately adjacent to the untouched plants surrounding the cleared area. In section 1, the plants would remain untouched except for monitoring growth of Phragmites. In section 2, stalks would be cut 5 cm above the surface using secateurs in mid-July and growth monitored. In section 3, stalks would be cut below the surface using a sharpened spade in mid-July and growth monitored. In section 4, stalks would be cut below the surface using a sharpened spade in mid-July and mid-August and growth monitored. In section 5, stalks would be cut below the surface using a sharpened spade in mid-June, mid-July and mid-August and growth monitored. All effort will be made to disturb the soil as little as possible. All cut plant material will be removed and taken to the composting site at Humber. These plants in the study area are not in standing water. There is a wetland restoration area with water nearby. The land is low compared to the surrounding areas residential areas and may be wet in spring. The number, height and diameter of stalks at 5 cm above the soil level in each 1m x 1m plot within each section will be measured and recorded at appropriate intervals throughout the summer. Other plant species in the test plots will be identified and counted at the same time. 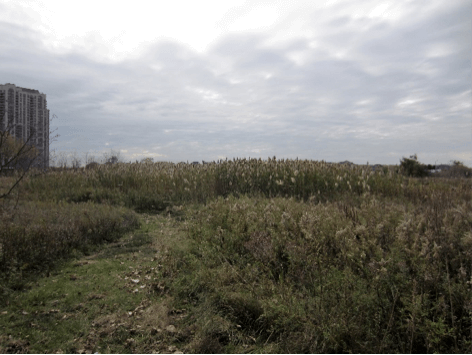 Percent coverage of Phragmites and other species will be calculated for each plot. During August, the number of plants with flower heads will be counted in each plot.